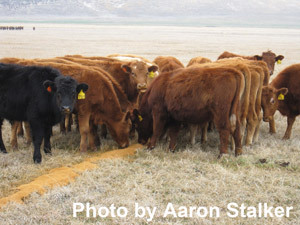 As fall weaning approaches for many cow-calf producers, those that have the facilities and resources for retaining ownership may want to evaluate whether or not they can increase returns by adding weight to their calves. Value of Gain (VOG) is the value per head of the animal at the end of the feeding period (sales value) less the value of the animal at the beginning of the period (purchase value) divided by the weight gain. VOG is not constant and is particularly sensitive to market seasonality consistent with the changing nearby feeder cattle futures market contract associated with a given ending weight. Why is this important to cow calf producers? Because the value of gain needs to be greater than the cost of gain for the producer to make money. Below is an example of calculating VOG. The prices used for 550-pound and 750-pound steer calves were from USDA cattle market data summarized and reported for Nebraska and posted October 2, 2015. The number of steer calves represented for 550-pound calves was 530 head and for 750-pound calves was 718 head. Cow-calf producers should take the time to calculate an expected Value of Gain this fall as they evaluate retaining ownership this fall. Doing so may bring clarity to the decision of whether to sell calves or retain them.